The reactor walls of future fusion reactors will absorb fusion fuel one million times slower than previous research had indicated. A layer of bound hydrogen on the surface of the tungsten wall seems to protect the deeper metal layers. An international team led by FOM PhD researcher Rianne 't Hoen has published this finding in Physical Review Letters. 't Hoen did her research using the plasma generator Pilot-PSI of FOM Institute DIFFER. In a fusion reactor, heavy isotopes of hydrogen (deuterium and tritium) fuse into helium. As a result of this clean energy in the form of heat is released. 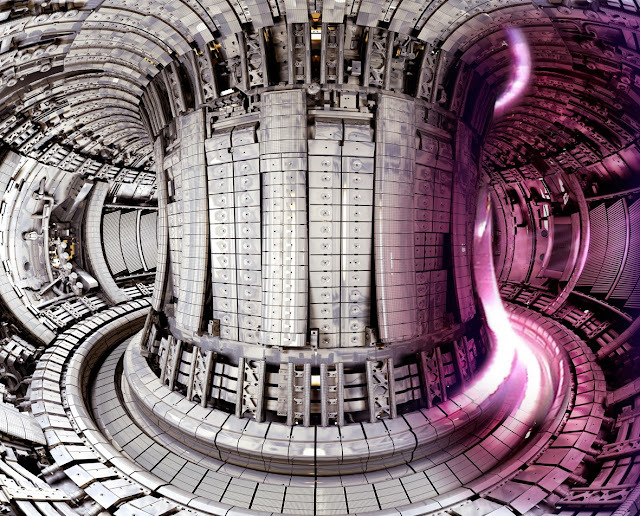 The exhaust of a fusion reactor must be able to withstand large quantities of heat and particles. Nevertheless the reactor walls always absorb some of the fusion fuel. As for safety reasons only a limited quantity of fuel may be present in the reactor, physicists are trying to minimise the amount of hydrogen absorbed by the wall material. Therefore the advanced future reactor ITER will be fitted with an exhaust made from the metal tungsten. 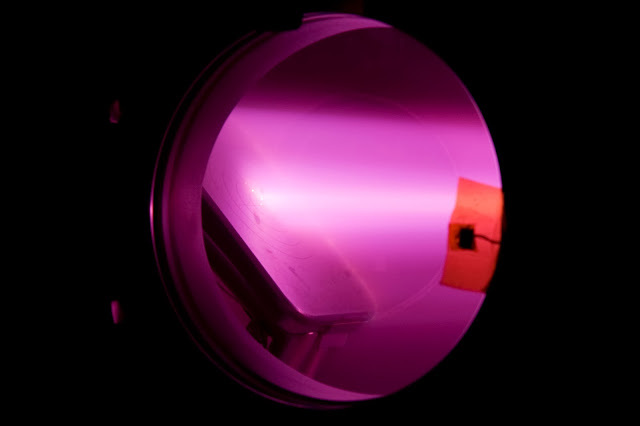 Tungsten has a high melting point, is a good conductor of heat and absorbs little hydrogen, although this absorption can rise by several orders of magnitude under the influence of neutrons from the fusion reaction. PhD researcher Rianne 't Hoen and her colleague Dr Pedro Zeijlmans van Emmichoven from DIFFER did their experiments together with colleagues from the University of Amsterdam and the Max Planck Institute for Plasma Physics in Garching, Germany. They discovered that the chances of hydrogen particles being absorbed by tungsten drops by a factor of one million under the extremely high flow of particles expected in ITER. The team simulated the intense conditions in the exhaust of a fusion reactor using DIFFER's device Pilot-PSI. When they compared how much hydrogen hit the walls of the reactor and how much actually penetrated the metal, they discovered an unexpected shielding effect. "It would appear that a protective hydrogen layer one atom thick arises on the metal surface," says 't Hoen. "That would give a perfect explanation for the energy barrier we measured." The hydrogen atoms that arrive at the tungsten surface collide with the atoms in the protective layer, as a result of which they lose a large amount of their energy. Consequently only one in one million hydrogen atoms penetrate into the deeper metal layers. Although the conditions in the experiments performed are very similar to those in a reactor exhaust, they are not identical. For example, the particles in the large-scale fusion reactor might collide with the tungsten with a greater energy. Future research will examine the effect of the particles' energy and the surface temperature on the hydrogen uptake in tungsten. Now read: Cold fusion reactor independently verified, has 10,000 times the energy density of gas. Get every new post delivered to your Inbox. How To Run Android Apps On Windows Using Windroy? Copyright © 2018 Tracktec. All rights reserved.